2015 Earth Day Panel Discussion: 10:00 a.m. in Speakers’ Corner. 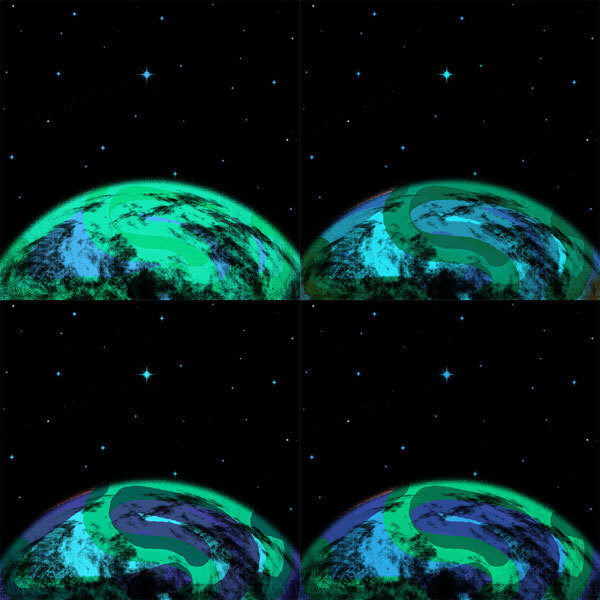 In honor of Earth Day, we will hold a panel discussion on working towards sustainable solutions. Panelists who have devoted their careers to some aspect of sustainability will discuss their work. The challenges and opportunities of working daily to address environmental issues will be discussed. Questions and discussion between panelists and the audience are encouraged. A light continental breakfast will be provided. For more information, contact Liesel Schwarz. VSB Peer Tutor Office Hours. 6:00-7:30 p.m. in room 205. Open to all VSB students. Walk-in study sessions. (Tuesdays, Wednesdays and Thursdays throughout the semester.) For more information, contact: Julie Freedman. Irish Studies Conversation Circle: 6:30-8:30 p.m. in room 204. The Irish Studies Program hosts a conversation circle about topics concerning Irish history and culture on behalf of the program. Open to all! For more information, contact: Jerry Sweeney. TOMORROW! 2015 Falvey Scholars Awards Presentation& Reception Ceremony: 9:00 a.m.-12:30 p.m., Room 205. At this event, Falvey Scholars award recipients will give short presentations on the content and findings of the research involved in the writing of the thesis or in the creation of the project report. Presentations will be followed with a closing by the Rev. Fr. Peter M. Donohue, OSA, PhD, University President, in which he will focus attention on the importance of both undergraduate and graduate research on campus. He will also highlight another significant event concerning the recognition and celebration of student research—the Sigma Xi Research 2015 event, which will take place in the Connelly Center immediately following Falvey Scholars. Falvey Scholars attendees will be invited to visit Connelly for the Sigma Xi event. Refreshments will be served throughout the program.For more information about Falvey Scholars: http://library.villanova.edu/about/projects/falveyscholars/ For information about the Sigma Xi 2015 event: http://www.csc.villanova.edu/~sigmaxi/events/index.html For more information, please contact Regina Duffy. 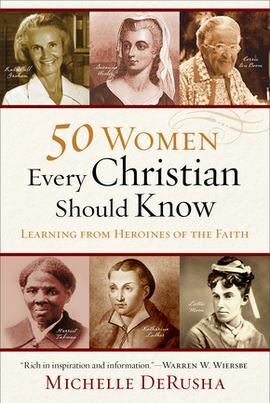 An excerpt from the introduction to 50 women every Christian should know made it clear that Christians and many non-Christians would consider these women heroines. 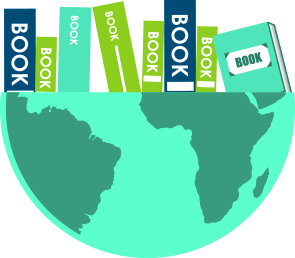 In commemoration of the 45th anniversary of Earth Day, celebrated this year on Wednesday, April 22, we will feature an ebook, one of hundreds of thousands available to Falvey patrons. User interface, licensing polices and access varies from publisher to publisher – and we’re the first to admit that it can be confusing – so feel free to contact a librarian when you need help navigating or downloading any e-resources you find in our catalog. 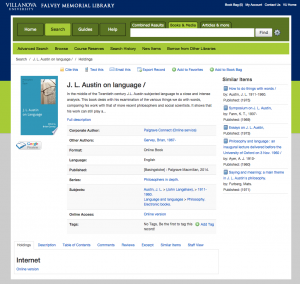 Today’s ebook is J. L. Austin on Language by Brian Garvey. 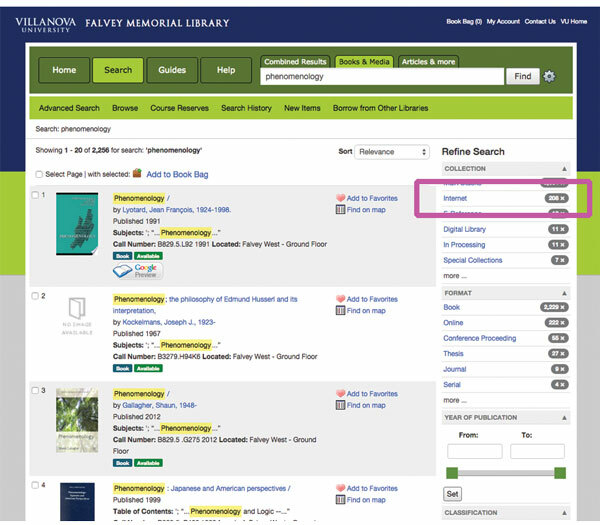 From the catalog: In the middle of the Twentieth century J.L. Austin subjected language to a close and intense analysis. This book deals with his examination of the various things we do with words, comparing his work with that of more recent philosophers and social scientists. It shows that his work can still play a vital role in enhancing our understanding of language. 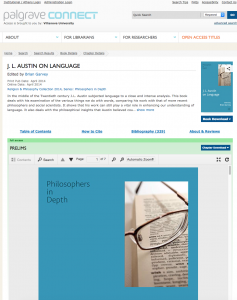 It also deals with the philosophical insights that Austin believed could be gained by closely examining the uses of words by non-philosophers. The school of thought that Austin’s name is usually linked with — ‘ordinary language philosophy’ — is often overlooked today. 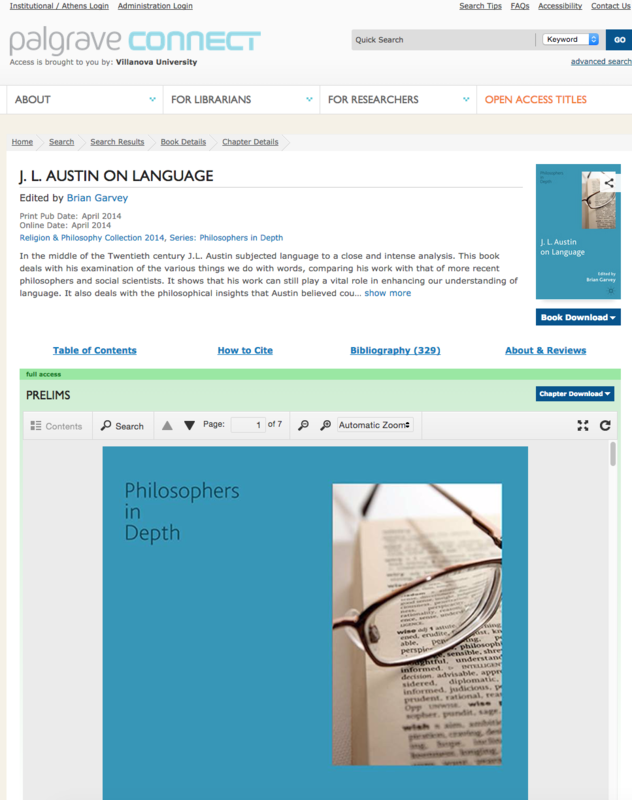 This book contains both criticisms of Austin’s philosophical work where he used this approach, and defences of it that aim to show that it can still be a source of valuable insights.